eMMC flash is commonly soldered directly to the board. Some eMMC flash are pluggable, but it is hard to find a reader to use on PC. 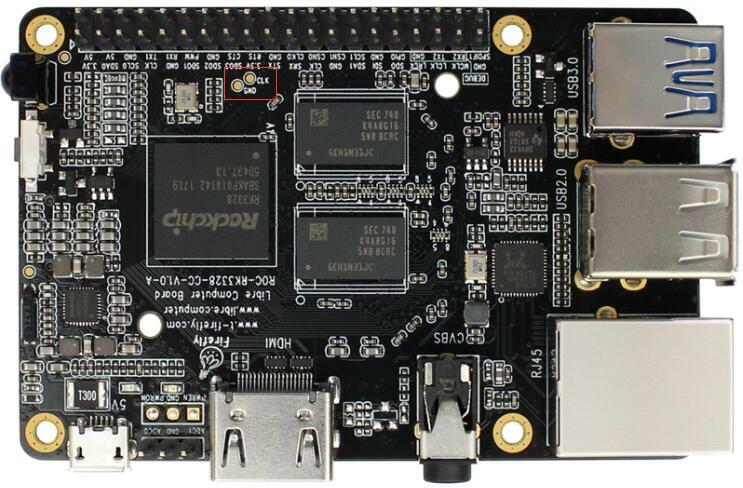 Therefore, eMMC is generally flashed onboard, that is, running to tiny system on the obard, which reads firmware data from PC and flashes to eMMC. Depending on the existing data on the eMMC flash, there are two special boot modes: Rockusb Mode and Maskrom Mode. You usually just need to enter Rockusb Mode for upgrading an existing Android OS or Firefly Ubuntu OS, which is packed with RK Firmware format. Maskrom Mode is the last resort when Rockusb Mode is not available due to bootloader damage, or you need to flash Raw Firmware to eMMC. If the board powers on and finds a valid IDB (IDentity Block) in the eMMC, it will continue to load the bootloader from the eMMC and pass execution control to it. 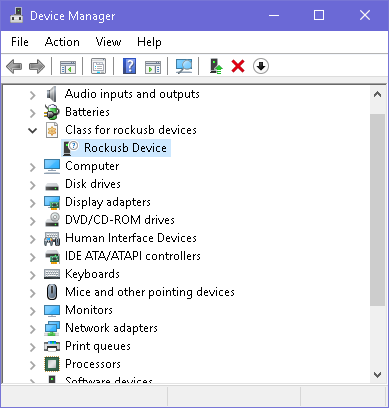 If the bootloader checks that the Recovery button is pressed and USB connection is made, then it enters the so-called Rockusb Mode, waiting for further instructions from the host. Micro USB cable to connect power adapter and board. Male to male USB cable to connect host PC and board. Pull all the USB cables (including micro USB cable and male to male USB cable) out of the board, to keep the board powering off. Install the eMMC and pull out the SD card. 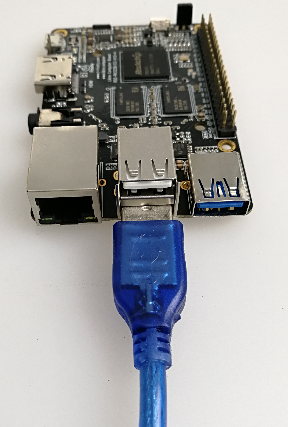 Use the male to male USB cable to connect the host PC with the USB 2.0 OTG port (the lower one in the double-decker ports) of the board. Keep the RECOVERY button on the board pressed. Plug in the micro USB cable to the board to power up. Wait about 3 seconds before releasing the RECOVERY button. The bootloader on eMMC is damaged. eMMC read data failed by connecting eMMC data/clock pin to ground. then no valid IDB (IDentity Block) will be found in the eMMC. The CPU will execute a small ROM code, waiting for the host to upload via USB a small DDR blob to initialize the DDR memory, and later a full bootloader to handle further firmware upgrading. This mode is called Maskrom Mode. It involves hardware operation to force into MaskRom Mode, which has certain risk and should be carried out VERY CAREFULLY. Metal tweezers to connect eMMC clock pin to ground. Pull all the USB cables (including micro USB cable and male to male USB cable) out of the board, to keep the board power off. Connect the eMMC CLK and GND pads with metal tweezers and keep holding steadily. Plug in the micro USB cable to the board to power on. Wait about 1 seconds before releasing the metal tweezers. 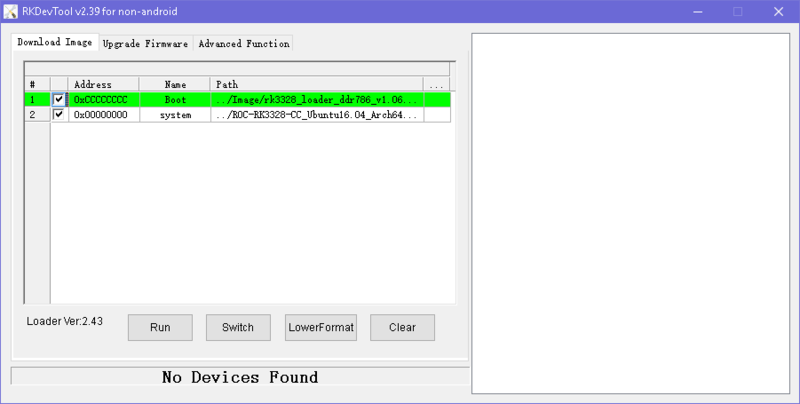 AndroidTool is used to flash Raw Firmware, RK Firmware and Partition Image to eMMC. To use AndroidTool, you need to install Rockusb Driver first. Download DriverAssistant, extract the archive and run DriverInstall.exe inside. Click the “驱动安装” button to install the driver. If you want to uninstall the driver, click the “驱动卸载” button. Download AndroidTool, extract it. Locate the file named config.ini, and edit it by changing the 4th line from Selected=1 to Selected=2, in order to select English as the default user interface language. If your device is in Rockusb Mode, the status line will be “Found One LOADER Device”. If your device is in Maskrom Mode, the status line will be “Found One MASKROM Device”. Raw Firmware needs to be flashed to offset 0 of eMMC storage. However, in Rockusb Mode, all LBA writes are offset by 0x2000 sectors. Therefore, the device has to be forced into Maskrom Mode. Force the device into Maskrom Mode. Switch to the “Download Image” tab page. Keep the first line of the table unchanged, using the default loader file. Click the right blank cell on the second line, which will pop up a file dialog to open the Raw Firmware file. Click the “Run” button to flash. Force the device into Rockusb Mode or Maskrom Mode. Switch to the “Upgrade Firmware” tab page. Click the “Firmware” button, which will pop up a file dialog to open the RK Firmware file. The firmware version, loader version and chip info will be read and displayed. Click the “Upgrade” button to flash. Keep the first line of the table unchanged. Delete all others unused rows by selecting “Delete Item” from the right-click popup menu. Add partition image to flash by selection “Add Item” from the right-click popup menu. Check on the checkbox on the first cell. Fill in the address with the sector offset (plus 0x2000 if in Maskrom Mode) of partition in parameter.txt file. Click the right blank cell to browse to the Partition Image file. You can add multiple partitions to flash by repeating step 6. You can skip the partition flashing by checking off the checkbox in front of the address cell. In Maskrom Mode, you must add 0x2000 to the sector offset of the partition in parameter.txt. See Partition Offset for more detail. upgrade_tool is a close-sourced command line tool provided by Rockchip, which supports flashing Raw Firmware, RK Firmware and Partition Image to the eMMC. Then add udev rules by instructions here, in order to have permission for the normal user to flash Rockchip devices. If you skip this, you must prefix the following commands with sudo to have the right permission. rk3328_loader_ddr786_v1.06.243.bin is the copied loader file after compiling U-Boot. It can also be downloaded from here (choose rk3328_loader_xxx.bin file). system.img is Raw Firmware after packing, which can also be Raw Firmware downloaded from official site (decompress first). You can write individual Partition Image to the eMMC. Depending on the original content of the eMMC, the instructions can be somewhat different. If the original firmware format is raw, chances are that it is using the GPT partition scheme, and the predefined offset and size of each partition can be found in build/partitions.sh in the SDK. See Partition Offset for more detail. If the original firmware format is Rockchip, it is using the parameter file for partition scheme, and you can use the partition name to flash Partition Image directly. Force the device into Rockusb Mode. -b is a predefined shortcut for boot partition. If no shortcuts are available, use partition name instead (resource in above example). You can customize kernel parameters and partition layout according to Parameter file format. Once the partition layout is changed, you must flash the parameter file first, before reflashing other changed partitions. rkdeveloptool is an open-source command line flashing tool developed by Rockchip, which is an alternative to the close-source upgrade_tool. rkdeveloptool DOES NOT support proprietary RK Firmware. system.img is Raw Firmware after packing, which can also be the Raw Firmware downloaded from official site (decompress it first). The following instructions ONLY APPLIY to boards which are flashed with Raw Firmware and use GPT partition scheme. The predefined offset and size of each partition can be found in build/partitions.sh in the SDK. See Partition Offset for more detail. If RK Firmware is used, parameter.txt is used to define partition layout. printf "%-20s %-10s %s\n" "NAME" "OFFSET" "LENGTH"
Save it as a script in /usr/local/bin/show_rk_parameter.sh and give the script executing permission. © Copyright 2018, Firefly Team Revision 26365360.